Oh okay then, let's have a look. I'm not going to do one a day; no one wants to see that. Let's bash through the whole lot in one fat hit. 1. What published rpg do you wish you were playing right now? I want to play Mutant Year Zero. It's been sitting in my reading pile for a year or so but I haven't got it to the table yet. 2. What is an rpg you would like to see published? I may write a longer blog post about this but I think it's fascinating that computer rpg series like Final Fantasy spit out a complete ruleset and setting every couple of years and then move on; would anyone buy or play these games if they were released as tabletop rpgs? I would be interested, at least. 3. How do you find out about new rpgs? I don't follow any news sites or anything like that, so I tend to pick up on new releases when people get excited about them on Google+. 4. Which rpg have you played the most since August 2016? I am a sad loser and I have logged everything I've played and because these things are true I can tell you that it was the Frankenstein patchwork d100 game I used to run The Dracula Dossier. Thirteen sessions in all. 5. Which rpg cover best captures the spirit of the game? That's a great question. I can think of lots of covers I like but do they capture the spirit of the game? Fifth edition Call of Cthulhu has a wonderful cover but I don't think it's indicative of how the game plays, as such. 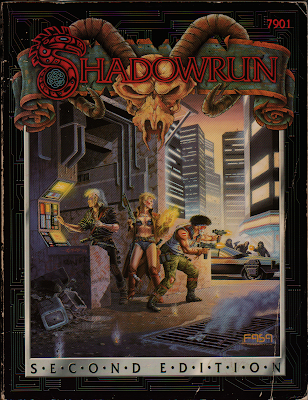 Of the games I own, I'm going to go with the second edition of Shadowrun; it's not the best image in the world -- the composition is a bit flat and that drain is given so much prominence that you'd be forgiven for thinking it's a main character -- but does a great job of showing what the game is about. 6. You can game every day for a week. Describe what you'd do! Assuming I've done all the preparation and I'm ready to go, I'd probably try out a bunch of games and play a different one each day. Maybe two a day, one after lunch and one after dinner. I know. Rock and roll. 7. What was your most impactful rpg session? "Impactful" is a horrible word. Eurgh. Stop it. Anyway, probably the most influential -- much better, see? -- session was the first time I played Call of Cthulhu. I'd played other rpgs before that, and it was Shadowrun that probably got me hooked, but that first CoC session was a profound and enlightening experience. 8. What is a good rpg to play for sessions of 2hrs or less? Anyway, two hours doesn't seem long enough to get going, once you've taken into account making the tea and moaning about what the Tories have done this week, but I'd go for something quick and easy, like Fighting Fantasy. I imagine you could rattle through a lot of content in two hours with that game. 9. What is a good rpg to play for about 10 sessions? Most campaigns I run last about ten to twelve sessions, so the easy answer is "any of them" but that's not very helpful. There's a suggestion in 13th Age to run a campaign in which everyone gains a level with each session and characters have ten levels in that, so you get this focussed and neat sort of "zero to hero" thing. I don't know if that means 13th Age is a good rpg to play for about ten sessions, but I'd like to give it a try some time. 10. Where do you go for rpg reviews? Reviews from R'lyeh is good, as is tenfootpole. Ramanan Sivaranjan knows what he's talking about, and I will always pay attention to what Patrick Stuart or Zak Smithsabbath like, although our tastes can often vary. 11. Which "dead game" would you like to see reborn? TSR's Saga System -- the one with the cards -- was ahead of its time and had a lot going for it, but died when TSR did. I'd love to see a new version. 12. Which rpg has the most inspiring interior art? 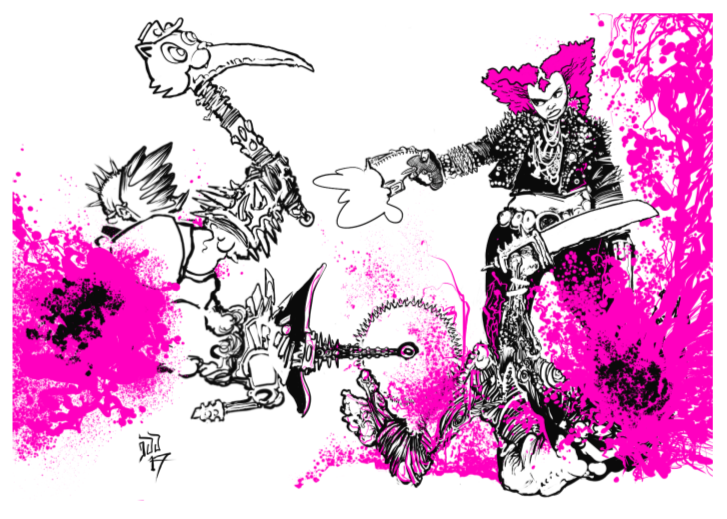 Death is the New Pink or Troika! because Jeremy Duncan is a genius. 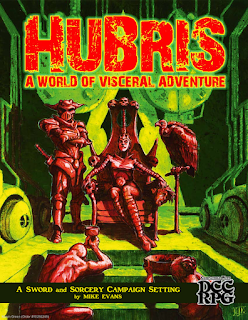 So are Jez Gordon and Zak Sabbathsmith, but I don't think there's a published rpg out that features their work. Yet. 13. Describe a game experience that changed how you play. I was going to blog about this. Maybe I did. I'm old and can't remember everything. Hrm. It was when I was running The Enemy Within II: The Enemy Within and the Temple of Doom and I noticed that WFRP2 sort of expects you to build non-player-characters according to the same rules as player-characters and I remember thinking "no, I'm just going to do what I like" and made up the statistics. It's sort of obvious and everyone else has probably been doing it for years but it had never occurred to me before and now I do it all the time. 14. Which rpg do you prefer for open-ended campaign play? I'm not sure how to answer this one because every open-ended game I've played has fallen apart at some point. 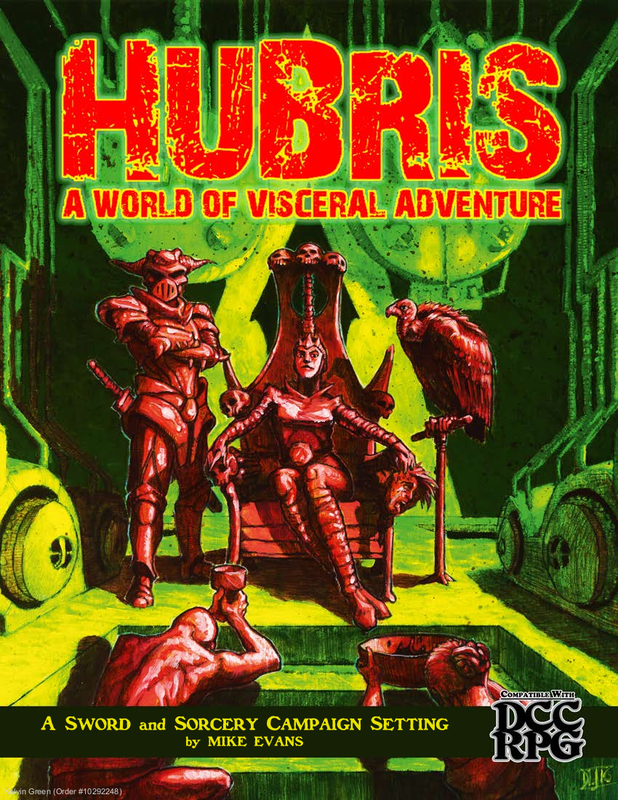 I would imagine that the best sort of rpg for this kind of campaign would be something where characters don't change much in terms of power level; perhaps something like basic D&D, the Chaosium d100 rules, or Traveller. 15. Which rpg do you enjoy adapting the most? I don't understand the question. Is this asking if I enjoy hacking games? If so, then I don't do it often because if I have to change a ruleset in order to run something then there's a good chance that there's already a different ruleset that's better suited to what I want to do. That said, I am a big fan of the Chaosium d100 rules and I find them easy to tweak and modify, so maybe that's my answer. 16. Which rpg do you enjoy using as is? See above. I'll drop rules if they make no sense or slow things down but for the most part I'm not much of a hacker. Fighting Fantasy and WFRP2 are both games that I run without changing much, if anything. 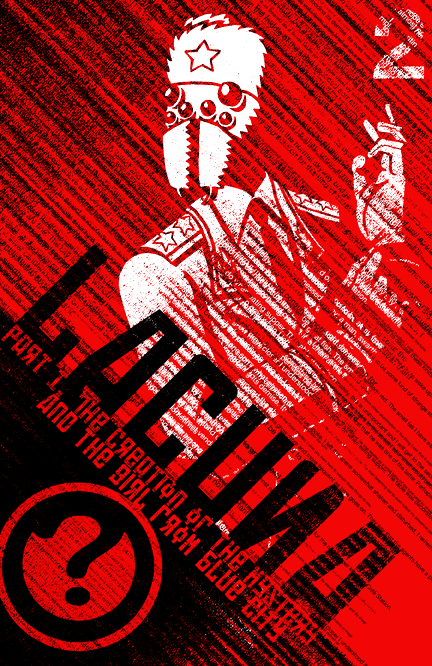 Probably Lacuna Part 1: The Creation of the Mystery and the Girl from Blue City. I've had it since 2009 and I've never got around to playing it. I find it interesting and I'm excited to play it but I also find it a bit intimidating and all I can imagine is making a right mess of running it. Ooh, crikey. I've played a lot of Pathfinder in recent years, and I played a stupid amount of Shadowrun when I was but a wee sprogling, but I reckon it's probably Call of Cthulhu. I've run three big-ish campaigns and have played double figure one-shots. It may be Pathfinder because that takes ages to play, but I don't like it nearly as much as I like adore Call of Cthulhu and I would be sad if I have played it more often. I get mine from eBay because all the shops that used to sell ancient rpg books have closed down around here. In the brief time during which I lived in Minnesota, the local Half Price Books was like a treasure trove of old rpg stuff, but I wasn't gaming at the time so I didn't pick anything up. Tsk. 21. Which rpg does the most with the least words? Probably one of these twenty-four hour games or two-hundred word rpgs but I don't think I've read any of them. Troika! is quite lean but also good. Let's go with that. 22. Which rpgs are the easiest for you to run? I have no patience for fiddly games any more so I only run games that are easy to run. This is one reason I like 13th Age; for the players it's like AD&D in terms of complexity and options but for the GM it's more like Basic D&D. 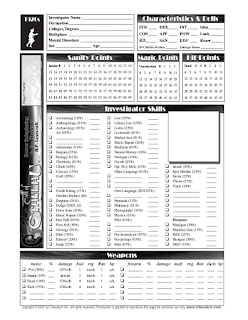 The easiest for me is probably Call of Cthulhu because the d100 system is super simple to use, and almost everything is on the character sheet. Then they ruined it by Pathfindering the seventh edition but I've already moaned about that. 23. Which rpg has the most jaw-dropping layout? Oh, did you mean jaw-dropping in a good way? 24. Share a PWYW publisher that should be charging more. I don't know of any PWYW publishers off the top of my head. Lamentations of the Flame Princess sometimes does it but it seems to work for James, so what do I know? 25. What is the best way to thank your GM? I think it depends on the GM. I always appreciate it when the players tell me they enjoyed the game and would like to play more. Alas, they tend to tell me this either (a) after the final session of the campaign, or (b) years after the game dribbled away into nothing because of -- I thought -- a lack of interest. Fist-shaking bitterness and tearful self-doubt aside, it never hurts to just say "thank you, I had fun". 26. Which rpg provides the most useful resources? Does this mean the core rules, or anything published for it? 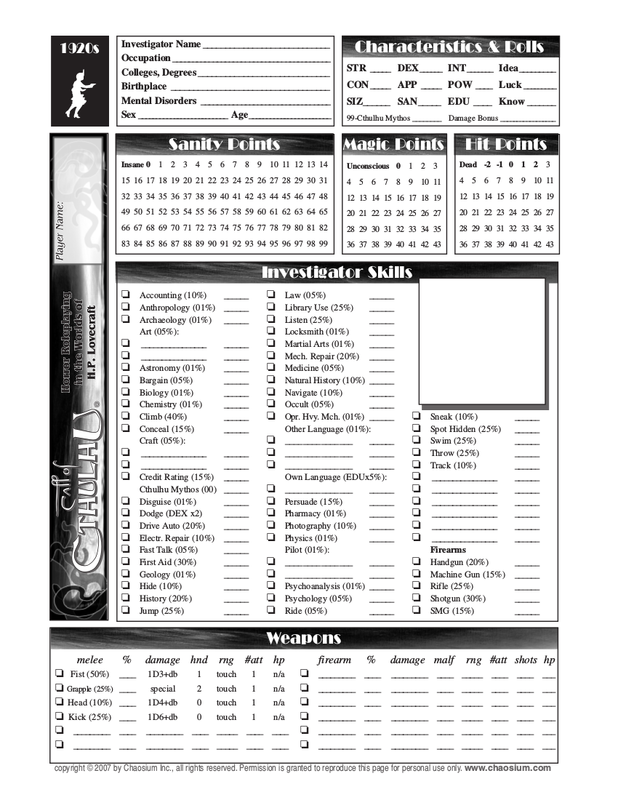 I use the d1000 mutation tables from Realms of Chaos: Slaves to Darkness whenever I can, but that's not an rpg. 27. What are your essential tools for good gaming? Whahuh? These are getting vague and weird now. A game and some people to play it. Anything else is optional. I mean, it doesn't even have to be a good game as long as you have good people. I keep thinking of when I played Mutant Chronicles when I was seventeen and it was terrible so we drank whisky as we played and I was sick in a bush. 28. What film/series is the biggest source of quotes for your group? We don't do quotes. Stupid comedy accents, on the other hand, we do a lot. Comedy German is a popular one. 29. What has been the best-run rpg Kickstarter that you have backed? The standard for rpg Kickstarters seems to be set so low that "deliver what was promised and on time" is considered some sort of achievement, rather than basic competence. That said, the Mutant Year Zero people know what they are doing and the Hubris Kickstarter was run well. 30. What is an rpg genre-mashup you would most like to see? I'm not a singer as I lack both the ability and the confidence, and it would probably be insufferable torture to watch in action, like a thousand Frozen Youtube videos in one, but I reckon there's potential in an rpg in which singing is used as some sort of resolution mechanic. 31. What do you anticipate most for gaming in 2018? That's a bit odd. Why not "the next twelve months" so it ties in with the next time everyone does this? Anyway, the thing I'm most excited about is that there will be not one but two new editions of Warhammer Fantasy Roleplay coming out soon. One will be based on the first and second editions and the other will be based on the absurd high fantasy of Age of Sigmar; I'm keen to see both. I have no idea if they will be out in 2018 but let's say they will be just to end this on a positive note.